Water Infuser 2-Pack Just $16.98! Down From $50! Shipped! You are here: Home / Great Deals / Water Infuser 2-Pack Just $16.98! Down From $50! Shipped! 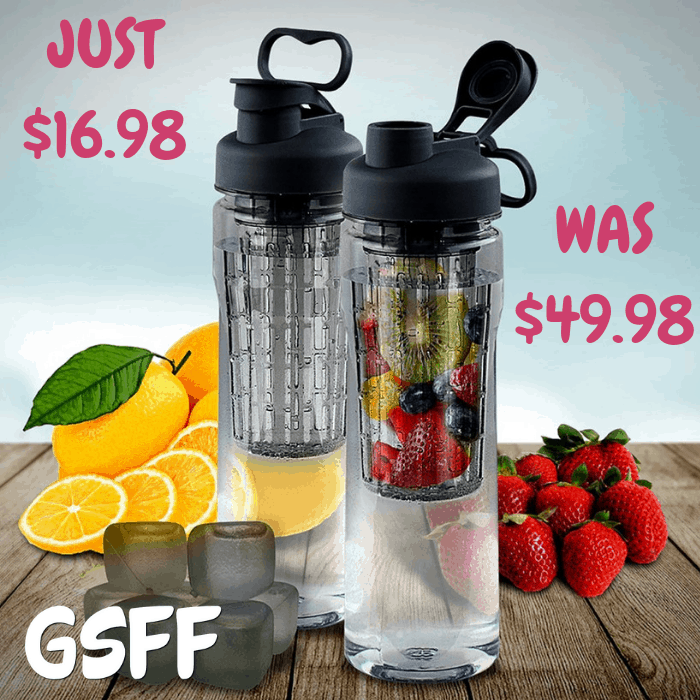 Head over to Proozy where you can score this Fruit Infuser Water Bottles 2-Pack for just $16.98 down from $49.98 when you use promo code PZY1698 at checkout PLUS FREE shipping! Sick of sipping plain old water all day long? Create your own personalized fruity flavored drinks with these 28oz. Fruit Infuser Tritan Water Bottles with Reusable Ice Cubes. Enhance Drinks Naturally with the Infuser cage which keeps fruit out of the way as you sip. Add fresh fruit such as sliced strawberries, cucumbers, lemons etc. or mix to make a fruit medley! Convenient and Eco-Friendly. Remove infuser to carry as a standard water bottle. Multi-finger grip handle for easy carrying. Top-rack dishwasher safe. Just ensure the lid is sealed evenly and guaranteed no leak! The mouth piece has rubber seal that will prevent spills when securely pushed in. Designed for easy quick sips! Pitcher lid twists on. BPA free Tritan.